gets off to a great start? We've got you taken care of. 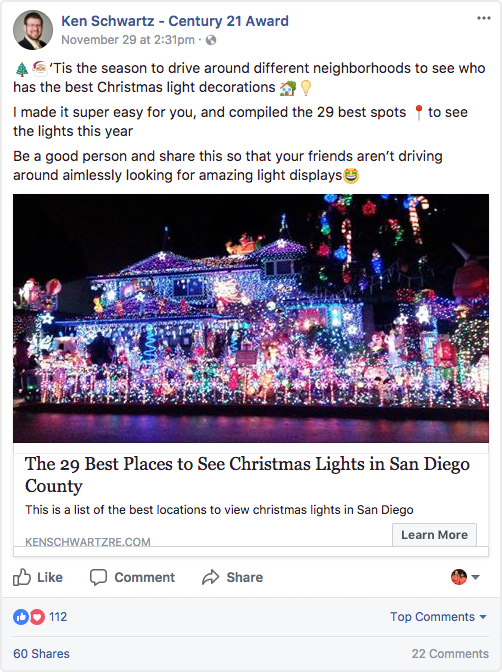 Ken Schwartz curated a comprehensive list of the 29 Best Places to See Christmas Lights in San Diego this year - and it got a ton of comments, shares, and nearly 1500 clicks back to his website. His total ad spend? $66.27. 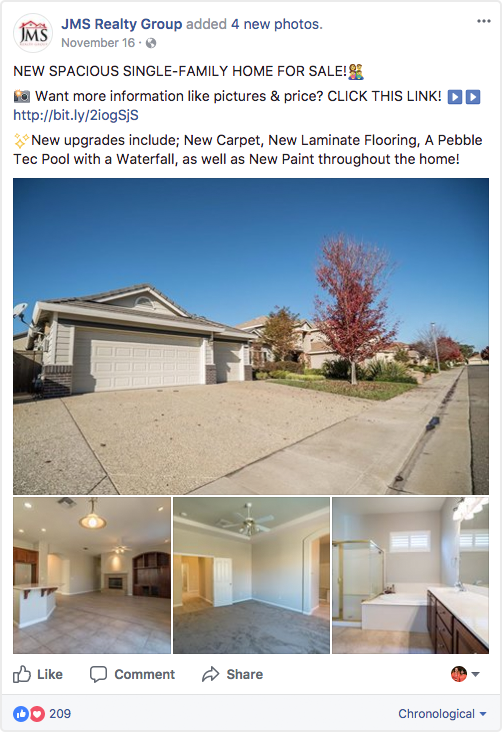 The Haltom Home Team scored big with a #JustListed post that got clicks and engagements for a penny apiece. 2,800 photo views, 700 website clicks, and 14,000 total impressions for a whopping total of $50. 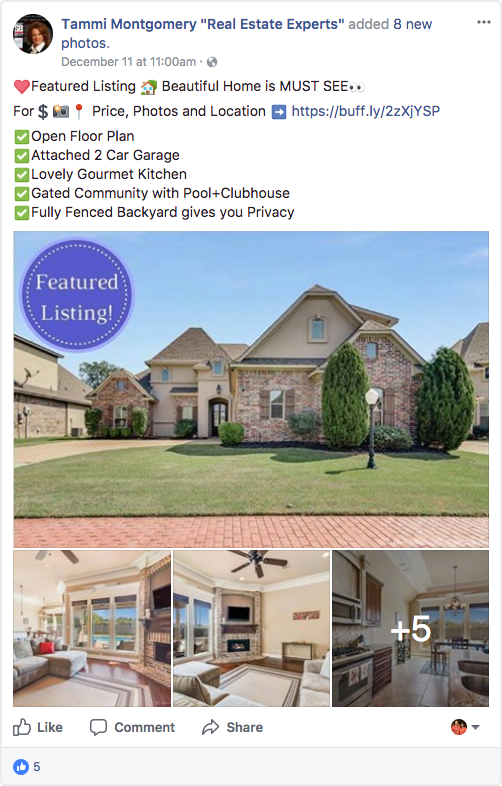 In less than one week, Tammi Montgomery's post about her Featured Listing in Bossier City, LA reached over 23,000 people. That's a third of the population of Bossier City seeing Tammi's ad for $100! 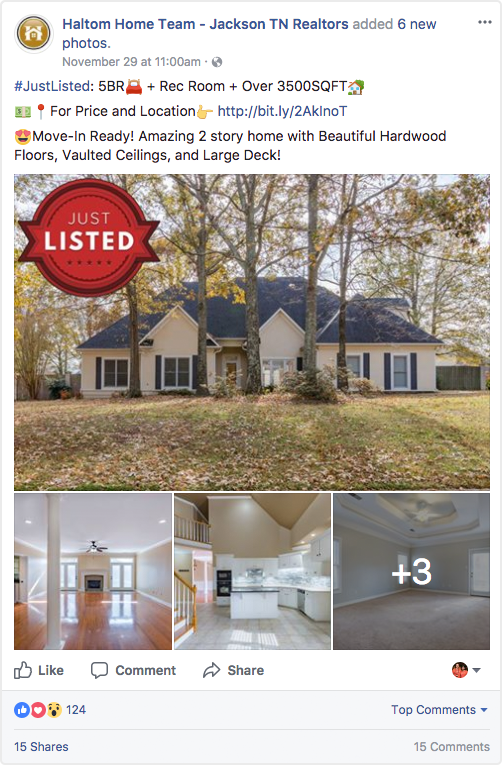 JMS Realty Group's New Home for Sale ad is another strong example featuring emojis, strategic use of ALL CAPS, and a clear CTA. This post wound up with 217 reactions, 44,000 impressions, and 6,200+ photo views, all for $350. 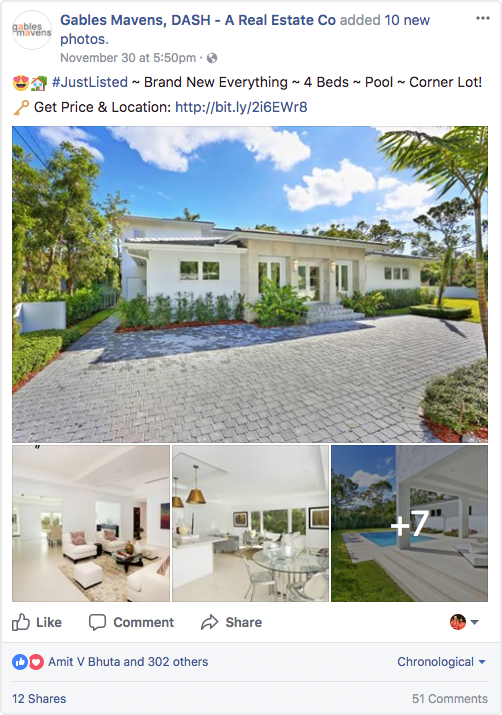 The Lea Team's #JustListed post is an all-around excellent ad - take note of the CTA embellishment on the featured image. For just $125, this post was seen by nearly 20,000 people and sent 1,800 of them back to The Lea Team's website. 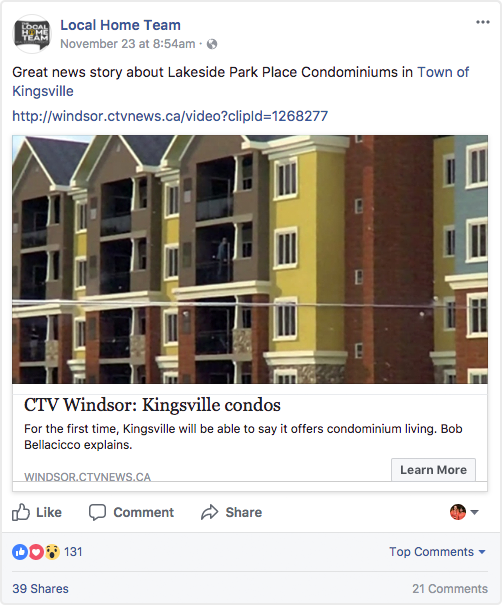 The Local Home Team's post about a new offering of condominiums took off, reaching over 81,000 people -- and it didn't even drive traffic to their own website! But when a big news story in your market breaks, seize the opportunity to be the brand that helps get vital information to your community. Take note of the top comments on the post and you'll see this was $250 well spent. 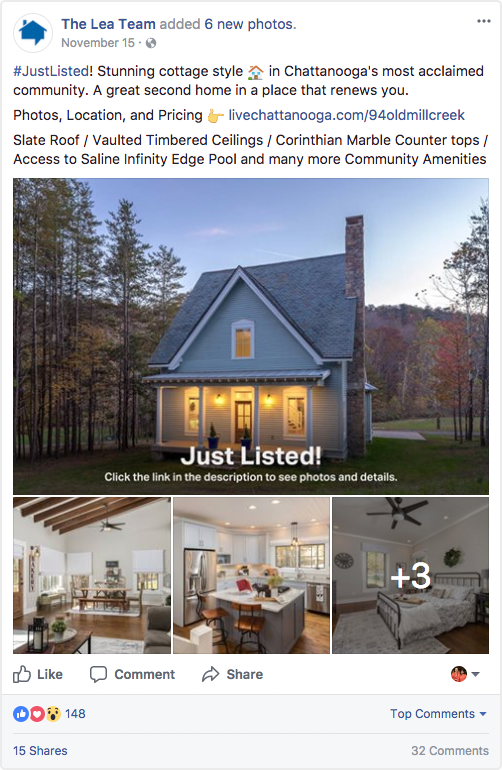 Gables Mavens created a Just Listed post that generated some real buzz - 35,000 impressions, 6,000 photo views, and almost 1,500 website clicks, all for $270. 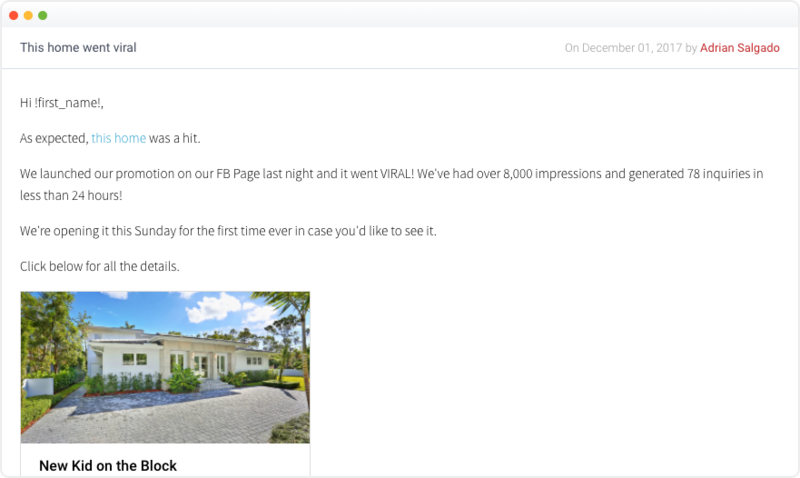 We preach doubling down on what works and here's a prime example why: The Gables Mavens make our list again with an email based on their successful Facebook post. 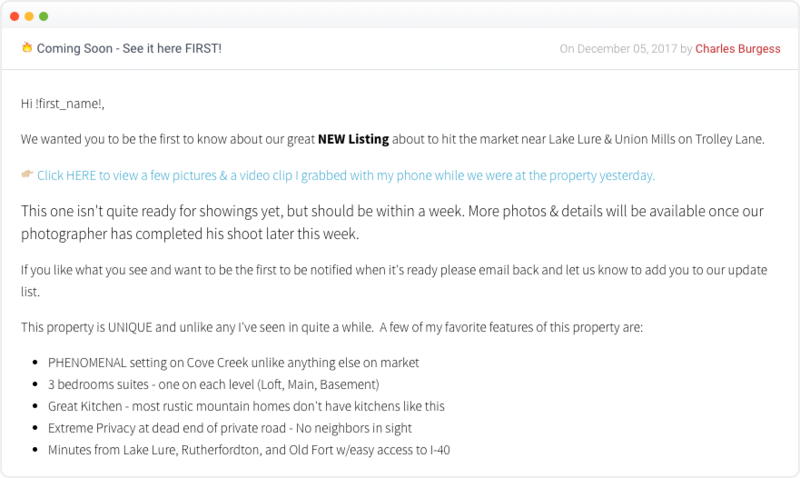 Adrian and Raul sent this email about the listing to a very engaged group in their database. Clearly this strategy works - this email was opened by 81% of its recipients! Subject Line: 🔥 Coming Soon - See it here FIRST! 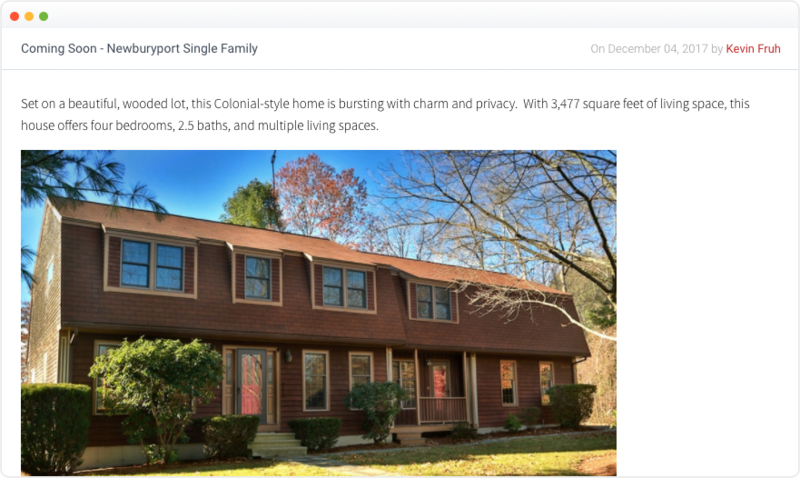 This email from Charles Burgess did a great job of highlighting a pre-MLS listing, coupling a strong CTA with just the right amount of information. The CTA (complete with emoji) worked like a charm: this email had a 19% click through rate. 1. He kept it simple. That subject line is direct and to the point. 2. He sent it to a list of prospects who are definitely engaged with his emails, selecting only leads who had opened one of his messages in the last 90 days. Sometimes marketing is about generating interest where there wasn't much before, but at its best, it's about reaching out the people who want to hear from you. 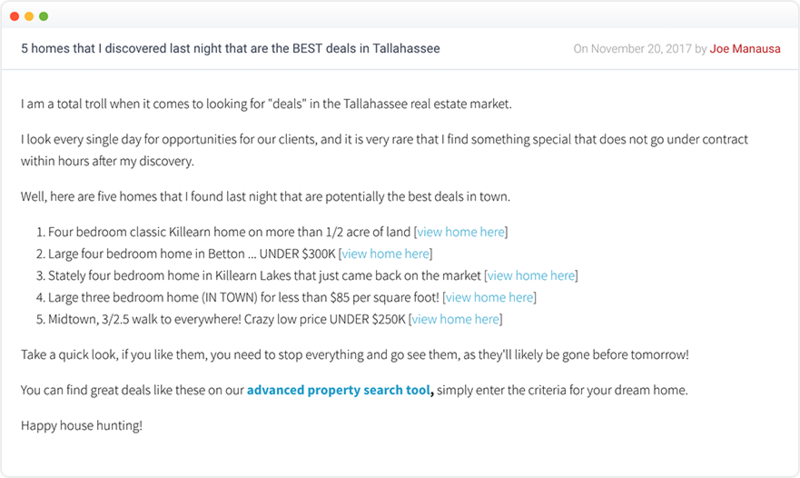 Josh Taylor's clever subject line (complete with emojis) led to a ridiculous 54% open rate, but even more impressive is the 16% CTR. Notice the use of multiple links - the image is a link, the city is a link, a clear "Click here" CTA under the photo... it's very easy to click through in this email. Joe Manausa's clever subject line works because reads more like a story than a plea for attention. Plus check out the funny, conversational first sentence of the body, which shows up in the email preview and gives recipients a little extra information before they decide whether they're opening or not. All that resulted in a solid 22% open rate (and 6% click through rate) on this email. 5% click through rate - that's 484 clicks! 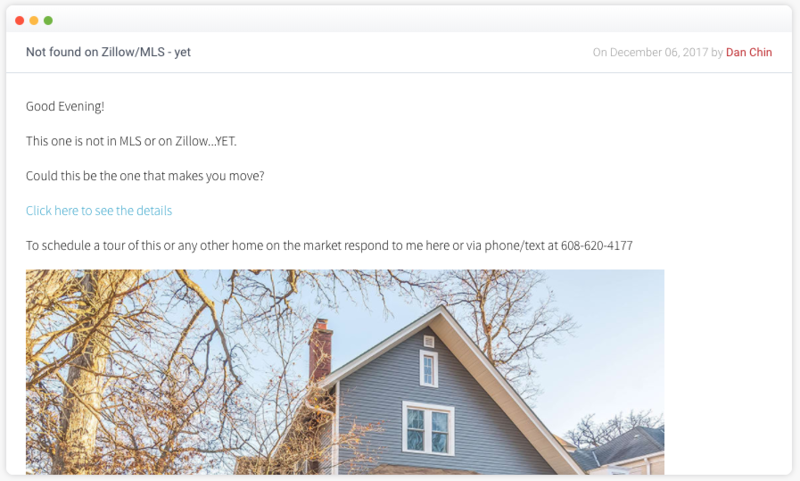 Notice Dan's second link is a CTA to check home values, making the message applicable for potential sellers as well as buyers. 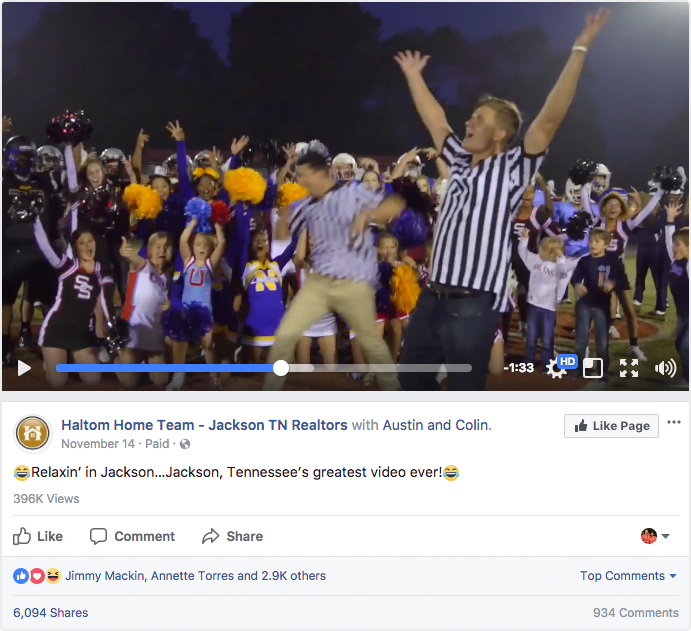 If you're feeling creative and looking to go viral, look no further than the Haltom Home Team. Their music video "Relaxin' in Jackson" has nearly 400K Facebook Video views (with 6000+ shares and nearly 1000 comments). 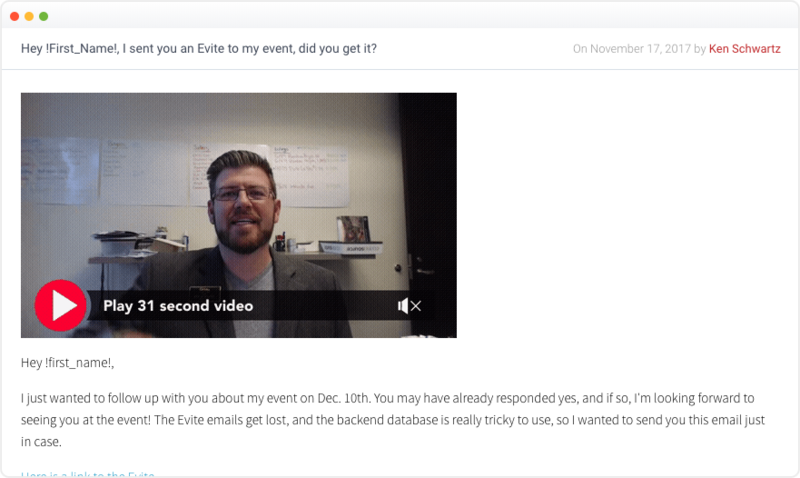 Subject Line: Hey !First_Name!, I sent you an Evite to my event, did you get it? 1. It's a follow-up email. 2. It's to clients and past clients only, so he uses a merge field. 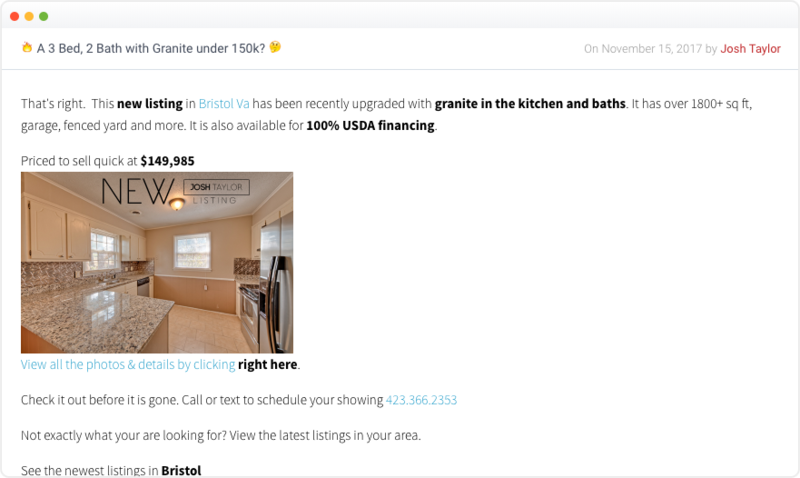 That kind of targeted personalization resulted in some amazing stats: 61% open and 14% CTR. Paul Kaplan's video message is short, to the point, and has one key element that cannot be overlooked: an adorable co-star. 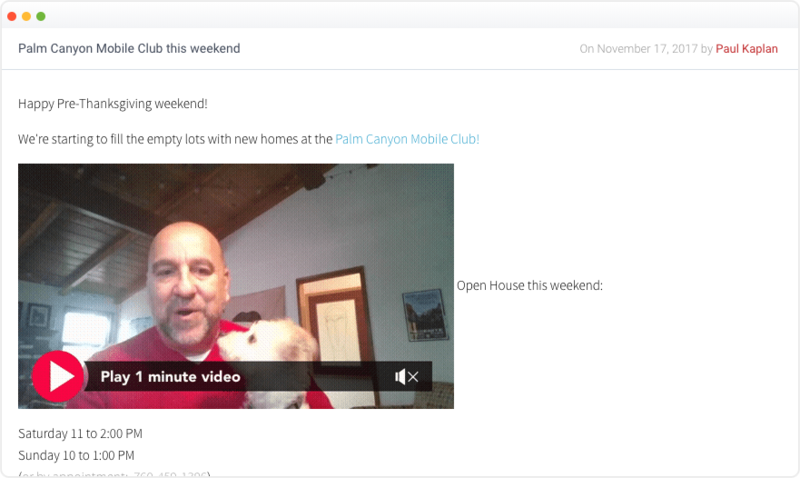 You don't have to use a dog in your marketing, but the numbers don't lie: Paul's video message had a 37% open and 8% click through rate. Dean Linnell's weekly series "Friday Morning Coffee" is a great example of consistent marketing. 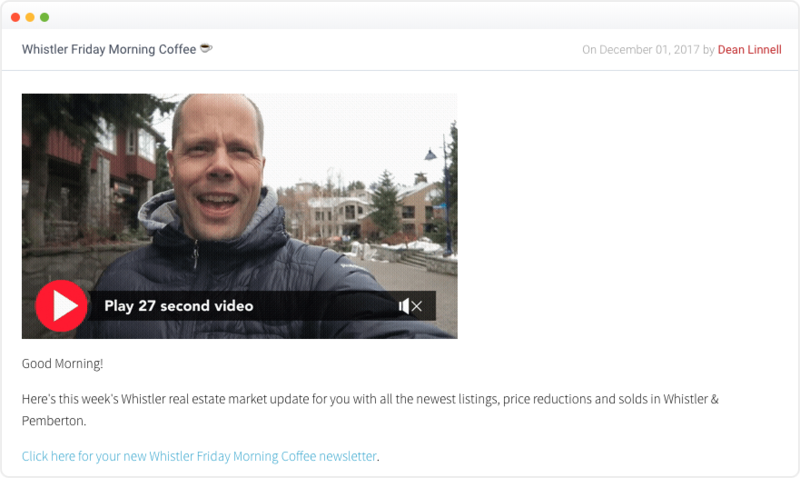 Each week, Dean sends a short video along with a link to a comprehensive blog post of all the real estate activity in Whisler. With a click through rate of 5%, Dean has nearly 500 people watching his video and reading his latest blog content. Want us to run your Facebook ads and send your emails for you?